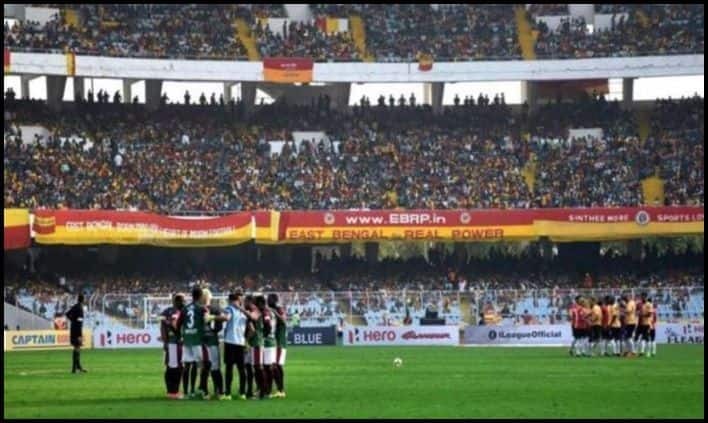 Indian football’s fiercest rivalry will be on display once again when giants East Bengal take to the field against Mohun Bagan in the I-league on Sunday. Indian football’s fiercest rivalry will be on display once again when giants East Bengal take to the field against Mohun Bagan in the I-league on 27th January. The Kolkata derby is one of the most anticipated matches in amongst the Indian club football frenzies. This match is more than just a game, not just for those participating in the pitch but also for the fans watching across the country. It’s a matter of tradition, prestige and bragging rights as to who prevails as the best team in the city of joy, where people live and breathe football. As it stands, it is East Bengal who have the edge in the I-league table as they are on the fourth position with 22 points, whereas Mohun Bagan is at the sixth position. However, it is just one point that separates the two sides. A win will close the gap on leaders Chennai City FC who are at the top with 30 points from 13 games. But a loss meant that East Bengal’s maiden title hopes will become shaky as Mohun Bagan, who are sixth in the table with 21 from 13 matches, will look to upset their rivals plans. Norde, who played a crucial role in their I-League triumph in 2015, has had a long injury lay-off. He has shown glimpses of his class, scoring four quality goals in the game time he has been able to cull out thus far. Pintu Mahata, Arijit Bagui and Omar Elhusseiny are all available for selection, which is definitely going to boost Mohun Bagan’s confidence. But Jamil will have midfield worries after the duo of Yuta Kinowaki and Darren Caldeira were outplayed against NEROCA. It remains to be seen whether they can hold their ground against red and golds’ Lalrindika Ralte and Kassim Aidara. With 22 points from 12 matches, the red-and-gold brigade are ahead on paper. East Bengal coach Alejandro Menendez has already said their Mexican recruit Enrique Esqueda is fit and is raring to go, making it a formidable attacking troika with Jaime Colado and Jobby Justin. Manoj Mohammad will be serving his suspension while Samad Ali Mallick is expected to slot in at the left back position. For Bagan, Eze Kingsley will lead the defence and a lot will depend on Bagan’s back four.